Actually, post sebelum ini dibuat 5 minit sebelum pukul 5 petang hari Rabu. 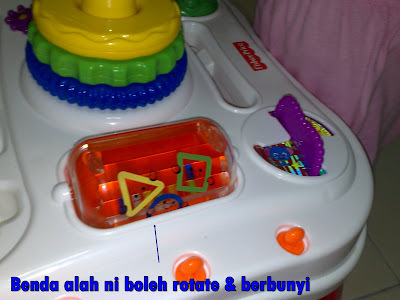 So, tu yang x sempat cerita dengan lebih lanjut how this "toy" works! Sorry ya! Yes, it is some sort of a "table" but i look at it more like an "activity table". 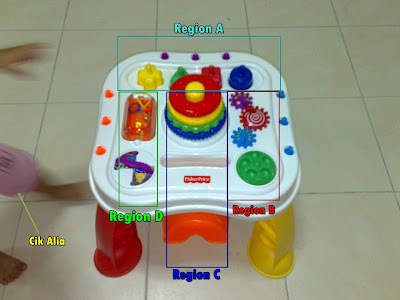 it has 4 regions (yang ini ibu alia pandai2 reka..). 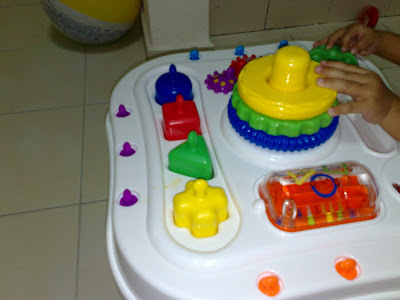 The idea is that the child can play around the table (instead of just one station). 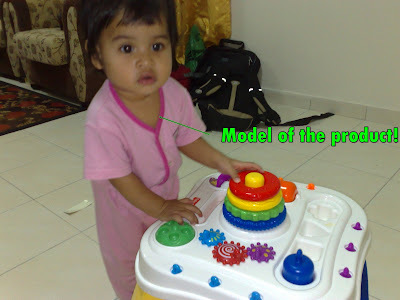 So here's my model of the product. Cute eh? 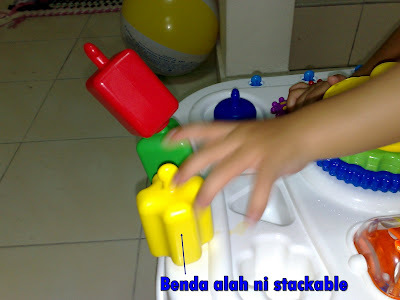 kita nak snap picture mainan dia, tup tup terus dia datang..
-there are 4 plastic blocks / shapes (ada square, ada circle, ada cross dan triangle). Semua shape tu pada kedudukan asal. -This is more simple. 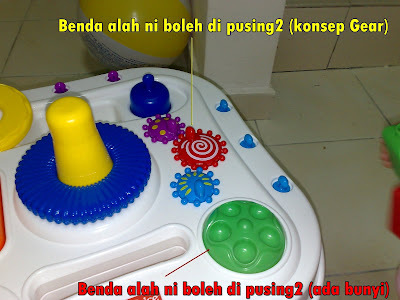 the 3 small circle yang ada button tu act as a gear. so the child can just rotate one and the other 2 will rotate as well. -Another one is the green circle, this thing has small holes (can fit a finger per hole), so this thing to can be rotated. and it will produce a sound. (sounds like 'crack..crack..'). -So far ALia kinda like this one. 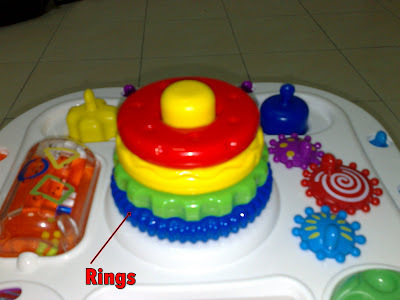 It has a 'tower' and we can stack 4 rings (and there are beads in the rings, so the rings produce sound!) at the tower. But ALia so far manage to throw away the rings everytime i assemble them. 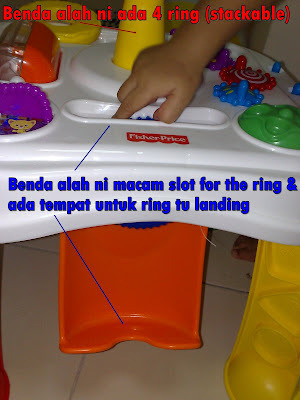 huhu..
-Besides the child can assemble the rings (according to the size), they can also put the ring into the slot and it also will produce sound, and the ring will fall to the orange thing and the child can pick up the ring from there. -this orange thing can be rotated and inside it, there are some beads that will produce sound! (sound lagi...) haha..
-last but not least, there's this thing that the child can rotate and each side has 2 pictures of cats (blue & red, green & yellow). err... mana ada complicated.. hihi,... nanti kita suruh neil main! hihi.. a ah.. mcm best je.. tp mahai la... :( kopak mak alia.. hihi..